Considering all the criticism I kept seeing about Steven Spielberg’s latest, I didn’t think it was all that bad. War Horse is based on a book of the same name by Michael Morpugo but as I’ve not read the book I can only judge the film for what it is – a film. 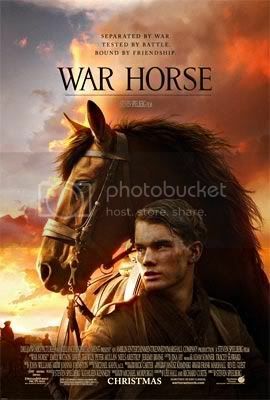 It tells the story of a horse named Joey, dearly beloved by his owner, a young boy named Albert Narracott (Jeremy Irvine). World War I begins and Joey passes through various hands – an English cavalry officer, German troops (twice) and a French girl. Albert enlists as soon as he is old enough and throughout the war maintains a hope that he’ll be reunited with his horse. It’s a rather standard tale – you know what the ending is going to be; it’s just a matter of how it gets to that ending. Nevertheless, there were parts that brought tears to my eyes – stories of separation tend to do that to me. I find that a good number of Spielberg’s movies have strong sentimental undercurrents, and this one did too. The ending might be a little saccharine for some, but I liked it. I think it needed that to balance the emotional tone of the film – there were parts that were really sad and grim, such as Joey and a fellow horse, Topthorn, being taken from the French girl, Emilie; or the execution of the two young German boys for desertion. With the darkness of war hanging over most of the film, it was touching to see happier moments, like two soldiers from opposite sides coming to a sort-of-truce to try and save a horse, or the reunion of Joey and Albert. Perhaps people with stronger emotional constitutions would have preferred it to be a rather grimmer story than it was, but I’m a softy and I like a happy ending in movies. The tricky thing about this movie is that you can’t exactly tell what the horse is thinking all the time, and it struck me that perhaps this sort of story is better told through animation. Yet if the horse could talk (to the audience at least)… would it take away some of the charm? There certainly are parts in War Horse when you know what Joey is thinking or feeling, thanks to good editing and some very well-trained horses. But a lot of it also requires imagination and the intiative to connect the dots. I think one would need to really take the part of the horse to follow it. If I had decided at the start that I didn’t like Joey, I would probably not have cared for the rest of the movie at all. I would say that if you like stories of friendship, or stories about horses, it’s not a bad watch. It’s certainly a movie with heart in it, whatever flaws it may have.